Recent events in international politics have highlighted the intricate interconnectedness between diplomatic crises and public opinion, notably public expressions of emotion. 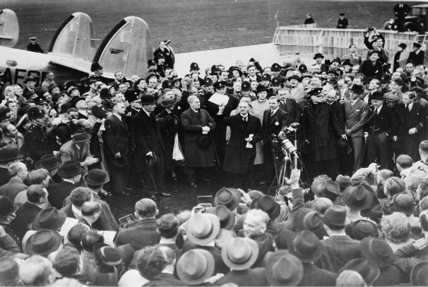 As the 80th anniversary of the Munich Crisis approaches, this conference will revisit this ‘model’ crisis and its aftermath, exploring both its lessons and its contemporary resonance. Few diplomatic incidents, before or since, have aroused such public excitement as the events of September 1938 and yet the ‘public’, the ‘people’, the ‘material’, and the ‘popular’ have hitherto been marginalised within a historiography that remains dominated by traditional ‘high’ politics perspectives, often reiterating the ‘Guilty Men’ orthodoxy. Recent incursions into the debate have made progress by experimenting with different methodologies, conceptual frameworks, and a greater plurality of sources, yet there has been a noticeable stagnation in original research. A re-evaluation is long overdue, and this conference will tap into the potential that rests in cross-disciplinary approaches and comparative frameworks. Indeed, the most neglected aspects of the crisis – despite the abundance of sources – are the social, cultural, material, and emotional, as well as public opinion. The conference will also internationalise the original ‘Munich moment’, as existing studies are overwhelmingly Anglo- and Western-centric. The ‘people’ (broadly conceived) – different generations, gender, class, etc. Internationalizing the crisis (especially encouraging how it played out in Eastern Europe, the Soviet Union, Scandinavia, the United States, the Middle East, the Far East, and the imperial sphere). Confirmed plenary speakers: Gabriel Gorodetsky, Christian Goeschel, Julie Gottlieb, Susan Grayzel, Mary Heimann, Daniel Hucker, Miklos Lojkos, Andrew Preston, Michal Shapira, Richard Toye, Karina Urbach, Jessica Wardhaugh. Proposals for papers of 20 minutes or panels of three to four speakers are invited. We are particularly keen to encourage contributions from postgraduate students, recent postdocs, and international scholars. Paper proposals should include a title, a 250-300 word abstract, and a short bio of each participant, and should be submitted to Dr Julie Gottlieb (julie.gottlieb@sheffield.ac.uk), Dr Daniel Hucker (daniel.hucker@nottingham.ac.uk) and Prof. Richard Toye (r.toye@exeter.ac.uk). Please send these by 18 December, 2017. With generous funding from the Max Batley Legacy to the University if Sheffield, it is anticipated that we will not need to charge a conference fee.